The Royal Stewart kilt is made from one of the most famous tartans in the world. And it is no accident, that the word Royal is included in the name of this Scottish tartan. Its origins go back to the Royal House of Stewart, which was founded by Robert II, who became King of Scotland in 1371. The tartan itself was designed Circa 1800, its designer is unknown. This particular kilt is also known as the Royal Stuart kilt. The Scottish name Stewart, was changed to the French spelling of the name by Mary Queen of Scots, to ensure correct pronunciation, while she was living in France. 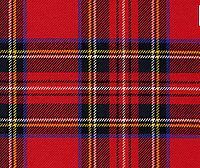 And the Royal connection continued down through the centuries, King George V referred to this tartan as "my personal tartan". And today is no different, as the Royal Stewart is considered to be a personal tartan of none other than, Her Majesty Queen Elizabeth II. And just as a clansman is entitled to wear the tartan of his clan Chief, the subjects of Her Majesty The Queen, (that is all British and commonwealth subjects) are entitled to wear this particular tartan. Below you can see a photo of the tartan. The royal connection also extends to many of the former Scottish Regiments, the most famous of which being, the Black Watch. Their royal designation goes back to 1881, when they were officially known as The Royal Highland Regiment (The Black Watch). And to this day the Royal Stewart tartan is still worn by the battalion's Pipes and Drums. 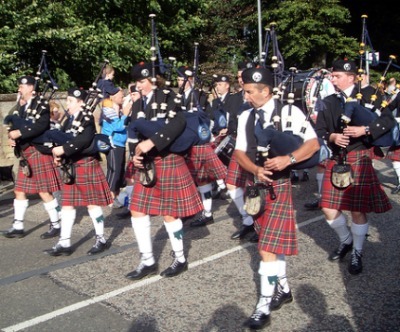 Civilian pipe bands also wear this very famous tartan, below you can see a photo showing the Peebles ex-service pipe band. This next photo shows the kilt being worn somewhat casually, and you can clearly see that it has been pleated to the set, as most civilian kilts are. 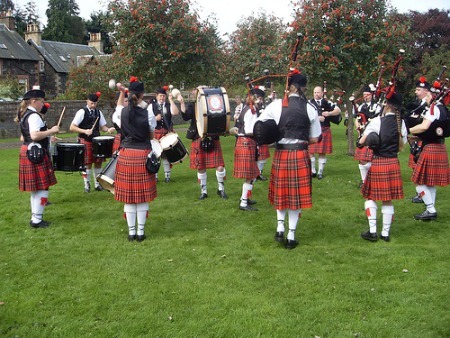 Next you can see the Galashiels ex-servicemans pipe band, taking part in the Melrose pipe band competition, and as you can see they also choose to wear the Royal Stewart tartan. It is officially worn by the Queen's Bands, who are the oldest university marching band in Canada, and is also worn by the Winnipeg Police Pipe Band. In the 1960's it was made famous in motor racing circles, as the three time Formula One World Champion Jackie Stewart, sported a distinctive band of Royal Stewart tartan around his crash helmet. It is the most commonly seen tartan at Scottish weddings, in fact most kilt makers who also hire kilts, keep more stock of Royal Stewart kilts than any other tartan. Indeed at my own wedding, my brother Raymond, who was my best man (groomsman) was wearing the Royal Stewart kilt, and the same tartan was chosen for the kilts for the children, who were the page boys. If you would like any further information on this particular tartan, or indeed anything kilt related, please drop me a line using the Contact Us page, and I will be delighted to help.